I was determined to be able to take part in this month’s mingle, and this is why you will find me, in the middle of winter, making Grapefruit And Honey Sorbet. I had recently purchased some grapefruit to make my Fresh From The Oven challenge of Breakfast Fruit Loaf, and the left overs were sitting in the fruit bowl, begging for attention. I was trying to think what to do with them, when I thought about sorbet. 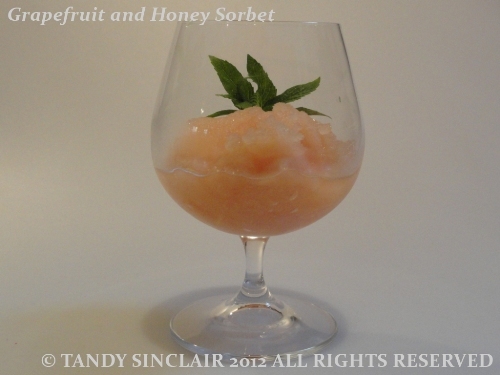 Now, this is something I would enjoy in the summer months, but I am not going to let something like rain get in the way of creating and enjoying a new sorbet. The challenge set for us this month from Cook Republic was to create a dish where one of the main ingredients was honey. Well, this sorbet has precisely two ingredients and honey is one of them! It fits perfectly well into the theme, even if it does not fit perfectly well with the weather. This is such an elegant & stylish dessert for a dinner party! So exclusive in flavours! Yum yum Yum! What a perfect, light summery dessert. Sounds lovely Tandy! Lovely combination of flavours. That sounds so easy! can you maybe do a blog about the ice-cream maker, or is there one already I can read? Delicious summer cooler – excellent. Wow – that was an easy but oh so delicious one! And I agree with Choc Chip…you can make sorbet whenever you want to!